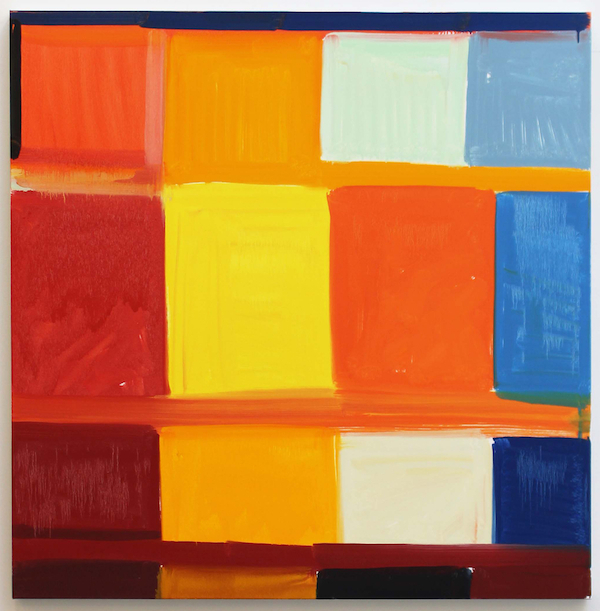 Stanley Whitney, Dance the Orange, 2013, oil on linen, 48 x 48". I ALWAYS HAD THE COLOR. I don’t know where it came from. My influences are many, from Titian to Edvard Munch to textiles, and the color comes from all kinds of places. Sometimes I go for a walk and I am looking for a yellow but I can’t find it in the world so I go back to my studio with a specific hue in mind. For a long time, my difficulty was how to make color the subject because the way we were taught is that color supports content. So much of my color resembles music, something that is intrinsically difficult to address in language. Jazz is misunderstood in the United States, but a friend expressed it best when he said, “When Charlie Parker came to Stockholm, he liberated the city.” We take jazz for granted as an American expression, but the intellect in music is hard to discern, because the fluidity of improvisation in, say, Ornette Coleman’s work conveys an ease. Similarly, African American art is typically understood as depictions of the body and not the intellect. Even today, it is a fight to be an abstract artist. A fight to be outside of blackness not in a postracial way, or as in Du Bois’s postulations about double consciousness, but almost in a class way, moving beyond demographics. Skin color remains, culture remains, but what does that look like—being outside of blackness as an artist, not being white and just being human? Over the years, I have become more comfortable with how I approach the canvas, how the red is laid on, and how things feel. When I was a student, if you weren’t drawing the figure, then what were you drawing? Drawing became the structure for my paintings, though. I still draw in black and white, without the vibrancy of color. The way the 4 x 4 grid came about in my work is I wanted the composition to be simple and have the color be magical. Color has always been about space for me. You have the Claudian space of the landscape painting—a central field framed on either side by trees—or the vast allover space in a Jackson Pollock, but how could one create space in the color on a grid? How could I lay two colors so close to each other and not trap them but rather allow air for the canvas to breathe? This became a sort of preoccupation for me. Creating space within color involves experiments with density, vibrancy, saturation, and even with matteness. It is not just formal for me—color has great depth; it can bring up great emotion and immense feeling. I studied with Philip Guston whose paintings always had luxurious skins, and I thought I wanted to paint like him. But in Florence I once saw a Botticelli that was saturated and matte at the same time, and in northern Egypt the architecture held up the color, so solutions to color handling are sometimes unexpected. I want everything in the paintings—the complexity of the world. I am often reading while I am working on a body of work, so the titles are snippets from poetry, literature, and music. “Dance the Orange,” for instance, is from Rainer Maria Rilke’s Sonnets to Orpheus: “Dance the flavor of this fruit as we experience it!” All the senses are engaged in the poem. I sit with the work after it is finished, waiting to name the paintings, and I won’t let them out of the studio until they have fitting titles.